This beautifully simple bouquet demands attention while complementing its surroundings with a casual elegance. 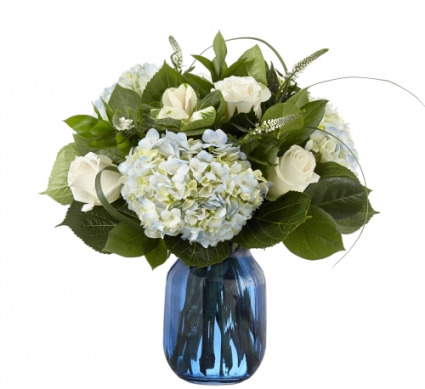 Comprised of white roses and hydrangea intertwined with green ornamental kale, white veronica and lily grass blades within a blue glass vase, the Crowned Bouquet has a classic finished look, perfected for all elevated occasions. Put a spring in their step with this beautifully blushing bouquet of hot pink roses, soft peach lilies and fresh green hydrangea. 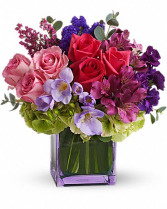 Arranged in a graceful vase tied with a charming bow, it's a chic treat for any occasion! 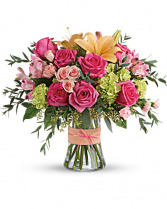 This sweet arrangement features green hydrangea, hot pink roses, pink spray roses, peach asiatic lilies, pink alstroemeria, green carnations, pink miniature carnations, seeded eucalyptus, parvifolia eucalyptus, and lemon leaf. 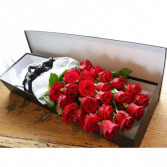 Delivered in a glass gathering vase.